My shiny new sewing machine was overwhelming straight out of the box, with buttons, knobs and levers all over the place. But these things are really user-friendly nowadays. I followed the threading instructions on the quick-start guide, and after a little time and a late-night phone call to my mom ("Do I really have to thread the bottom part of the machine too??" The answer is yes, yes you most definitely do. ), I was up and running. 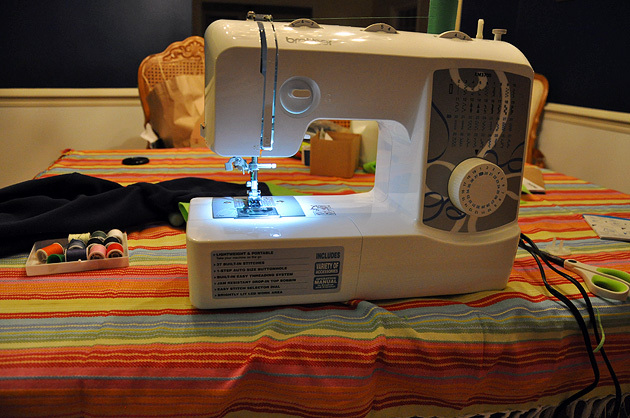 Lucky for me, when I was a kid my mom had taught me basic sewing machine skills, and it came back to me pretty quickly. I'm sure that true newbies could find youtube videos with the basics and still get going fairly easily. When my test sewing swatch was a success, I raced downstairs to show Ben, giddy with success and the possibility of sewing anything I could dream up. 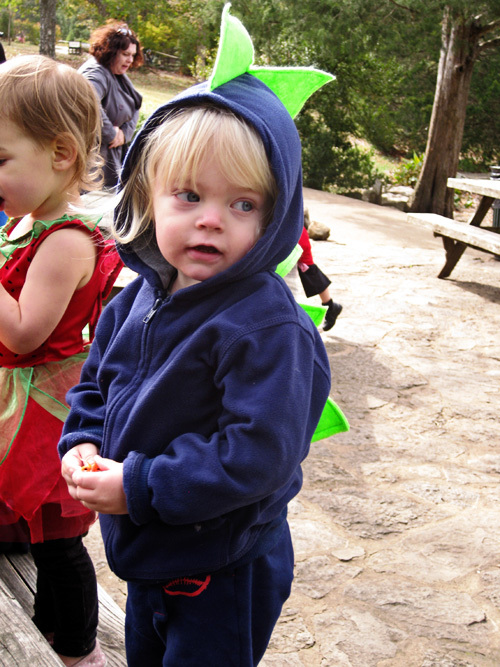 I had no real game plan for making Max's costume, but I had purchased an inexpensive hoodie, felt squares and a few spools of thread. (My total cost was probably about $15.) 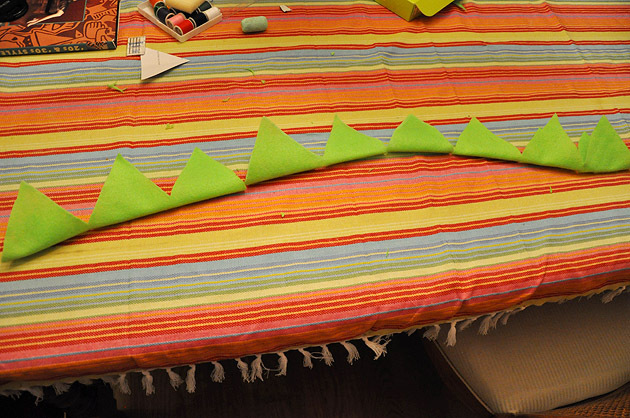 I used cardboard to make a triangle for the dino spikes, then traced it onto the felt with chalk. To make the spikes stand up, I doubled the felt over. 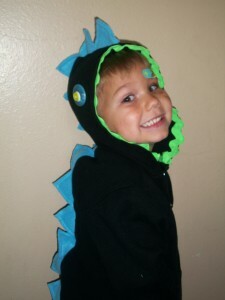 Then I pinned the spikes to the hoodie, fired up the sewing machine, held my breath, and put the pedal to the metal! This was the easy part, a straight stitch all the way down the middle of the spikes. 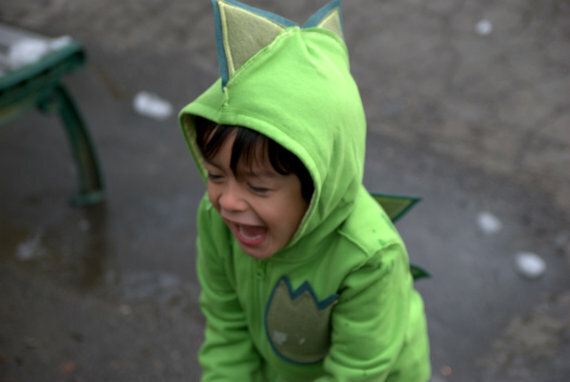 Once all my spikes were attached down the middle, I folded them up and sewed them closed. Easy peasy! 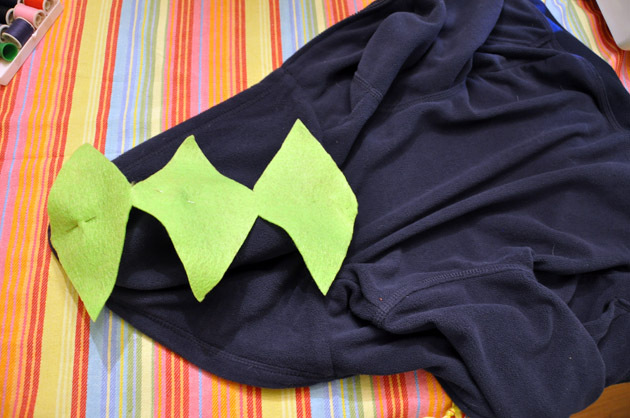 I originally intended to make a removable tail (so Max could use the hoodie for the rest of the winter) and add some eyes, but my energy level has been low and my nausea level high this first trimester, so I decided that spikes alone would suffice! 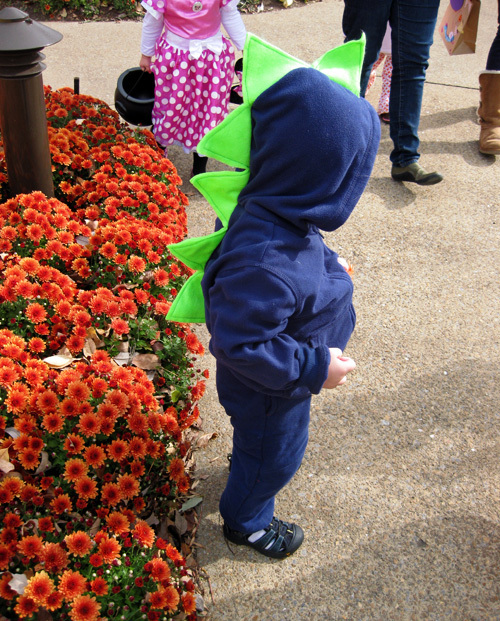 We went trick-or-treating with Max's buddies yesterday at our a local botanical garden, Cheekwood. 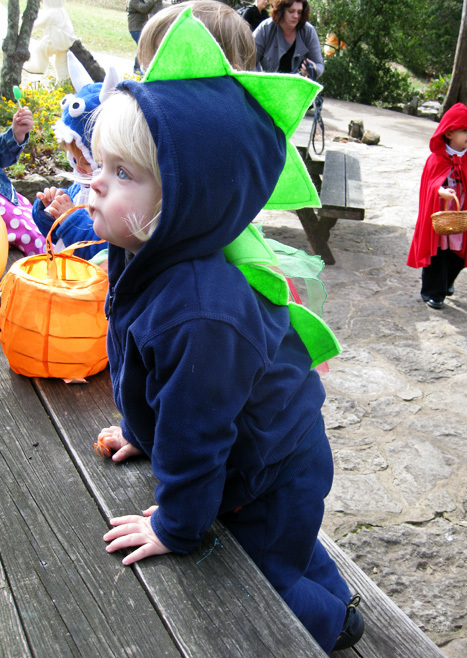 It was cold and Max wasn't really digging the chaos, but he still wore his dino with pride! 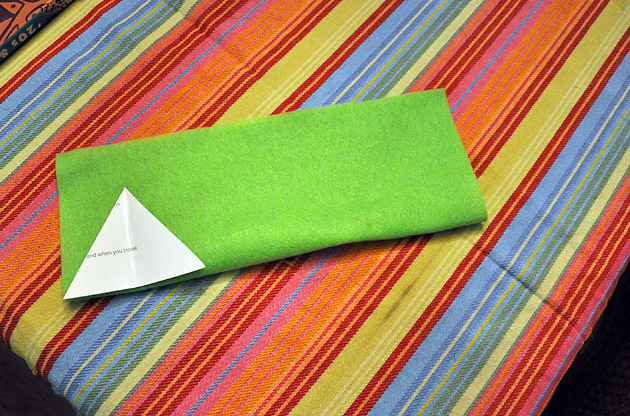 Two beginner-sewing lessons I learned? (1) Buy good sewing scissors!! I struggled through that felt with my kitchen scissors and would have gotten much more precise cuts with real sewing scissors. (2) Check what kind of thread you're getting. I wanted to do a decorative navy stitch on Max's spikes, but accidentally bought upholstery thread, which was thick and very difficult to work with - so much so that I ditched that plan!